An elongated oval chiton that grows to 12 cm in length. The girdle (dorsal portion of the mantle that borders the 8 shell plates) is shiny black, thick and leathery and covers all but the mid-dorsal area (Morris et al. 1980). Common in the middle and low intertidal zones attached to rocky substrate from Alaska to Point Conception, CA, and Kamchatka, Russia (Morris et al. 1980). The thick black girdle distinguishes this chiton from other species. Katharina are slow moving grazers that feed on many species of brown and red algae as well as benthic diatoms. Predators include leather stars, urchins, birds, sea otters and humans. Black Katy chitons are dioecious with external fertilization. An annual cycle of spawning has been noted with some seasonal variation among geographic regions (Himmelman 1978). Spawning is triggered by increasing temperature and may be linked to phytoplankton blooms. The females release small (about 230 mm in diameter) brown-colored eggs which are fertilized when the male releases his sperm. Once fertilized, the zygote develops into a free-swimming trochophore larvae. In laboratory studies these swimming larvae preferentially settled on a specific genus of coralline algae, Lithothamnium spp. (Rumrill and Cameron 1983), and rapidly metamorphosed into juveniles (within approximately 2.5 hours). 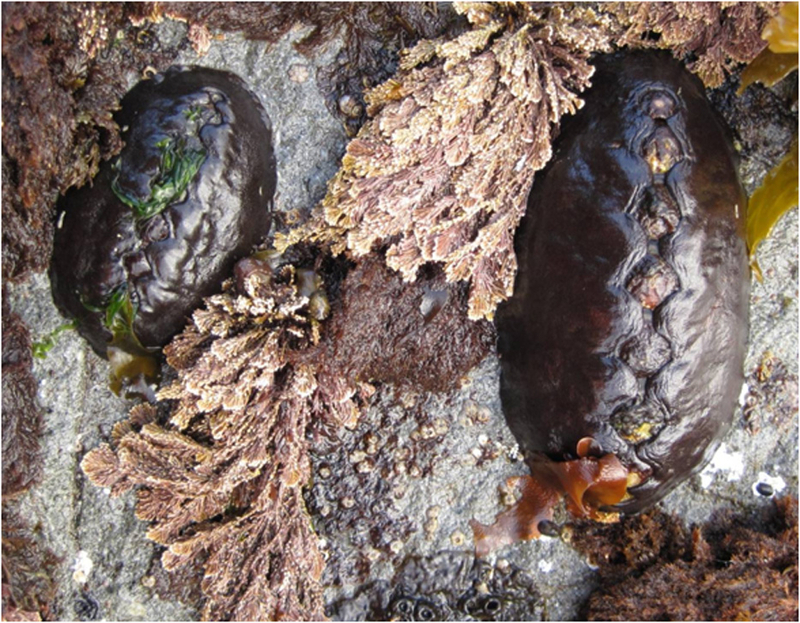 Metamorphosis is considerably delayed when the chiton settles on a substrate lacking Lithothamnium sp. Katharina tunicata typically reaches sexual maturity after two years (about 35 mm in length). After reaching maturity, adults live for about 3 years. Where K. tunicata attain both high densities and biomass they have been shown to have ecological importance in shaping community composition (Dethier and Duggins 1988). When K. tunicata feeds on large algae, more sunlight reaches the substrate on which they live. This increase in sunlight promotes the growth of diatoms, which are a favored dietary component of limpets and other chitons and may shift the composition of the algal community. Removal experiments of K. tunicata in Washington resulted in dramatic changes to the community structure (Dethier and Duggins 1988) with a resulting multilayered algal canopy and decrease in limpet cover. However; results in Alaska did not show a strong interaction between Katharina removal and community composition. A study by Salomon et al. (2007) looked at various factors contributing to the recent (10-15 years) decline in K. tunicata densities and sizes on the outer Kenai Peninsula, Alaska. Harvesting of Katharina occurs in this region and the species is part of a culturally important subsistence fishery for Sugpiaq (Chugach Alutiiq) natives. Human harvesting in this region dates back 3000 years. The study suggests the reduction in Katharina is due to multiple factors including the recent recovery of sea otters and increased fishing efficiency and effort in part due to indirect socioeconomic effects of the 1989 Exxon Valdez oil spill.